Above: A studio publicity portrait of Frankie Darro, circa 1933. 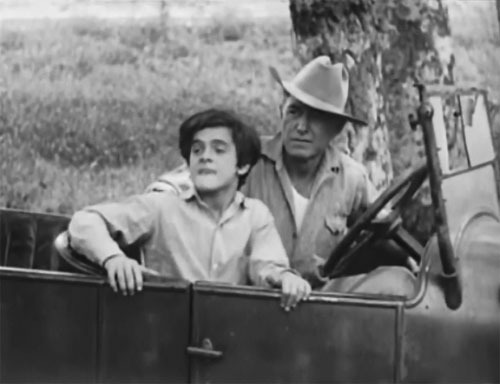 Of all the “kids” who supported full-grown leads in cliffhangers, Frankie Darro was definitely the most talented. A popular child star in the silent era, Darro spent several years of the early sound era playing juvenile co-heroes in serials for Mascot Pictures. Darro, an excellent athlete and a splendid actor, fit perfectly into the action-filled and highly dramatic world of Mascot’s serials. Typically cast as an orphan in his serials, Darro could be extremely affecting when portraying heartfelt grief, but balanced the tearful aspects of his roles with a youthful “gung-ho” energy that kept his characters from seeming saccharine and made them very believable as capable assistants to more mature heroes. During this time, Darro found a niche at low-budget producer Nat Levine’s Mascot Pictures; Levine was always on the alert for “name” actors in need of vehicles, and he signed Darro to appear in the 1931 serial The Vanishing Legion. This fast-moving chapterplay, set in the Oklahoma oil country, featured Darro as Jimmy Williams, the son of a reclusive rancher (Edward Hearn). Hearn, it proved, had a false murder charge hanging over his head, which was somehow connected to the war being waged against an oil-drilling company by a mysterious criminal called “The Voice.” To clear his father, the resourceful Darro teamed up with hero Harry Carey and the wonder horse Rex to unmask the mysterious “Voice.” Darro delivered an energetic performance, handling the serial’s action and melodrama (particularly in his scenes with his father) with equal skill. Legion set the pattern for Darro next three Mascot serials, all of which teamed him joined with an adult hero and an animal star. 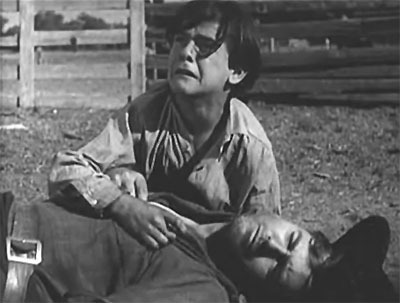 Above: Frankie Darro tries to help Edward Hearn, injured by the refractory wild horse Rex, in the first chapter of The Vanishing Legion (Mascot, 1931). Above: Harry Carey watches in surprise as Frankie Darro easily whistles up the otherwise uncontrollable Rex in The Vanishing Legion. The Lightning Warrior (Mascot, 1931) mimicked Vanishing Legion’s format closely; this time, Darro was Jimmy Carter, the son of a mine owner in the Old West. 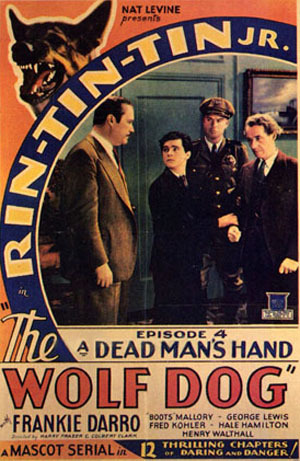 Darro’s father was murdered by the Wolf Man, a mysterious outlaw leader who was threatening to unleash Indian attacks on the community, and Darro set out to track him down with the help of hero George Brent (as the brother of a murdered army officer) and the amazing canine Rin Tin Tin (as the dead officer’s dog). Lightning Warrior was just as confusing and just as action-packed as Vanishing Legion had been, and, like the preceding serial, allowed Darro to display his talent for pathos as well as his acrobatic skills. 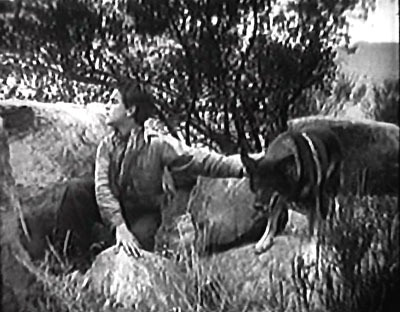 Above: Frankie Darro and Rin Tin Tin scout for Indians in The Lightning Warrior (Mascot, 1931). 1932’s The Devil Horse, one of Mascot’s best cliffhangers, gave Darro the most unusual of his serial roles. He was cast as Frankie Graham, a boy who had grown up with a herd of wild horses after his father’s death at the hand of a rustler band. Unable to speak English but able to communicate with the horses, Darro’s character lived a Tarzan-like existence on the prairie until he witnessed the attempted theft of a racehorse and the murder of a state ranger by the same rustlers that had killed his father. 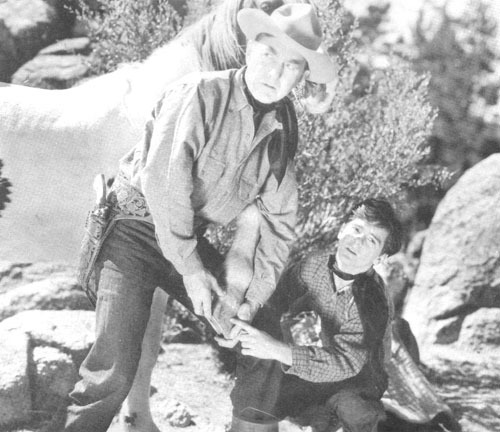 The ranger’s brother Bob Norton (Harry Carey) sought out the “Wild Boy” and enlisted his aid in tracking down the villains, while trying to acclimatize him to civilized ways. With the help of the racehorse El Diablo (played by “Apache”), the Wild Boy and Norton avenged both murders and corralled the smooth rustler leader (Noah Beery Sr.). Devil Horse’s plot required Darro to convey emotion sans dialogue in the earlier chapters; he did a fine job of dumb-show acting and did equally well in depicting his character’s gradual reacquisition of speaking ability. 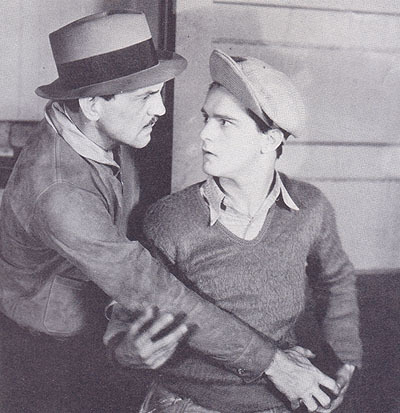 Above: Harry Carey and Frankie Darro in The Devil Horse (Mascot, 1932). The Wolf Dog (Mascot, 1933) was the last of Darro’s animal serials; this time his four-footed co-star was Rin Tin Tin Jr.. Darro played Frank Courtney, a boy raised in the Northern backwoods who turned out to be the lost heir to a prosperous steamship line; Rinty and hero George J Lewis (as an officer of the line) helped Darro protect himself from his scheming guardian (Hale Hamilton), who was determined to eliminate Frankie to retain control of the steamship business. Wolf Dog, like The Devil Horse, avoided the plot complications of Darro’s first two serials to emerge as another of Mascot’s best outings; Darro himself delivered yet another appealing and convincing performance, although he could by now have played such roles in his sleep. 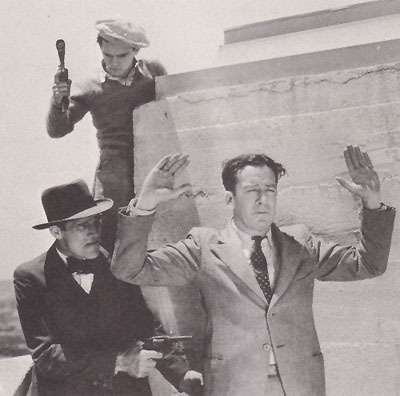 Above: Frankie Darro tries to keep his uncle Henry B. Walthall (far right) from being arrested in The Wolf Dog (Mascot, 1933). Hale Hamilton is on the far left. 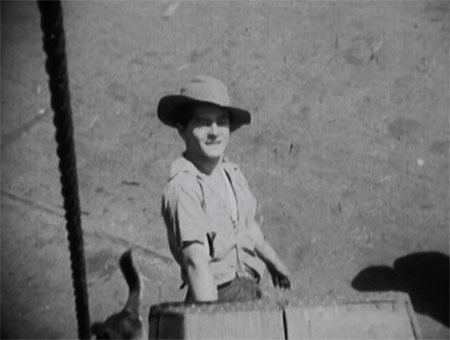 Above: Frankie Darro hitches a ride on a crate as it’s hoisted aboard a ship in The Wolf Dog; Pal, the titular dog, is disappearing out of sight below him. Also in 1933, Darro starred in William Wellman’s gut-wrenching Depression drama Wild Boys of the Road, receiving excellent reviews and altering his screen image. Producers impressed by his hard-edged performance in Wild Boys began casting him in major roles–usually as tough street kids–in big-budget movies like The Mayor of Hell and No Greater Glory; however, Darro’s new image was not enough to make him a full-time A-film star, and he kept working in serials and B-films as well. His next Mascot cliffhanger was 1934’s Burn ’Em Up Barnes, a wonderfully exhilarating serial that starred Jack Mulhall as the title character, a race car driver trying to protect a bus company from an unscrupulous businessman and his henchmen. Darro played Barnes’ ward Bobby Riley, who was seeking to follow in the footsteps of his late brother (Barnes’ best friend) as a newsreel photographer. Darro’s character, in an echo of his recent feature characterizations, was a little more cocky and comedic than his earlier serial kids, but still very likable and helpful. He and the equally energetic Mulhall made an ideal team, and helped to make Barnes the most enjoyable and satisfying of all Mascot’s serials. Above: Frankie Darro protects a film reel containing important evidence from Francis McDonald in Burn ‘Em Up Barnes (Mascot, 1934). Above: Frankie Darro prepares to clobber Bob Kortman, who has the drop on Jack Mulhall in Burn ‘Em Up Barnes. Darro’s final Mascot serial was The Phantom Empire, released in 1935. This wildly imaginative thriller introduced singing cowboy Gene Autry to matinee audiences, featuring him as a rancher and radio singer who not only was forced to battle land-grabbers but also discovered a futuristic lost kingdom called Murania underneath his ranch and became embroiled in its internal difficulties. Aiding Gene aboveground and below were Frankie and Betsy Baxter (Darro and child trick-rider Betsy King Ross), the children of his murdered partner; with their friends, they formed a group of “Junior Thunder Riders” in imitation of and opposition to the sinister Muranian cavalry, and frequently helped to save Autry’s life. Darro’s turn as the spunky, inventive, and quick-thinking Frankie practically stole the serial at times; his assured acting carried the inexperienced Ross and Autry smoothly through innumerable scenes in Empire. 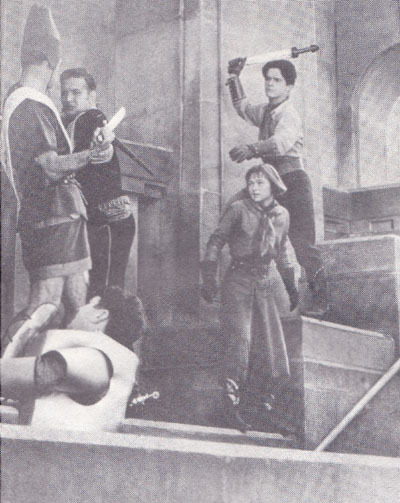 Above: Gene Autry and Smiley Burnette (at bottom of picture) battle a Muranian sentry; Betsy King Ross watches as Frankie Darro prepares to take a hand in the fray in The Phantom Empire (Mascot, 1935). 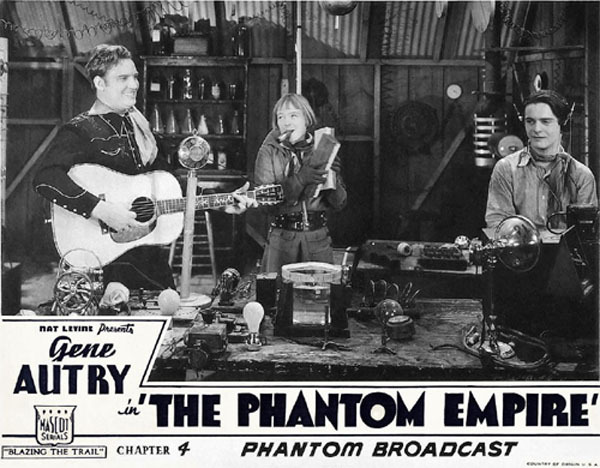 Above: Betsy King Ross and Frankie Darro help Gene Autry make an impromptu radio broadcast in The Phantom Empire. Also in 1935, Darro began co-starring in a series of low-budget action features for Conn Productions; these films (the first of which was Men of Action) imitated the format of his Mascot serials, pairing him with an older co-hero (first Le Roy Mason, then Kane Richmond) in an assortment of adventure stories. While working at Conn, he made occasional appearances in bigger features, now almost invariably cast as delinquents, jockeys, and the like. His Conn series came to an end with Young Dynamite in 1937, and he next moved to Columbia Pictures to feature prominently in a series of juvenile delinquency B-dramas (with titles like Reformatory and Juvenile Court) that imitated Warner Brothers’ Dead End Kids movies. While at Columbia, he appeared in their 1938 Western serial The Great Adventures of Wild Bill Hickok, playing an orphan named Jerry who ran away from a cruel employer (villain Eddy Waller) and lived with a tribe of friendly Indians. He helped hero Bill Elliott out of several scrapes, but was killed when the evil Waller knocked him off a cliff. Darro’s appearances in Hickok were limited, but he made the most of them and delivered one of the most moving death scenes in any serial. 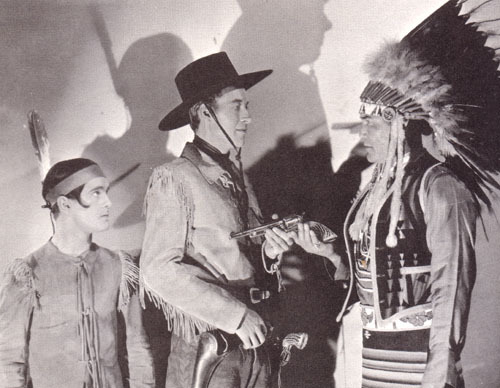 Above, from left to right: Frankie Darro, Bill Elliott, and Chief Thundercloud in a publicity still for The Great Adventures of Wild Bill Hickok (Columbia, 1938). In 1939, Darro abandoned his Columbia delinquent dramas to star in a series of amusing comic B-mysteries for Monogram Pictures, with comedian Mantan Moreland as his second banana; titles in the series included Irish Luck, Laughing at Danger, and The Gang’s All Here. He worked chiefly at Monogram until 1941, but took time out to deliver a truly memorable performance as the voice of the ill-fated hoodlum Lampwick in Walt Disney’s Pinocchio. In 1942, he appeared in Universal’s World War 2 serial Junior G-Men of the Air, which starred Billy Halop and several other former Dead End Kids as a group of tough kids battling a gang of Japanese spies. Surprisingly, Darro did not play one of the patriotic delinquents; he appeared instead in a couple of brief scenes as a responsible lab technician named Jack, one of the members of the clean-cut “Junior G-Men”–eventual allies of Halop’s group. After G-Men, Darro went to fight the Japanese for real, serving as a Navy Hospital Corps member in the Pacific theater of war. 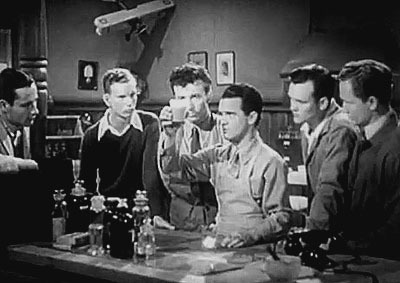 Above: Frankie Darro, beaker in hand, performs some analysis for his fellow Junior G-Men in Junior G-Men of the Air (Universal, 1942). 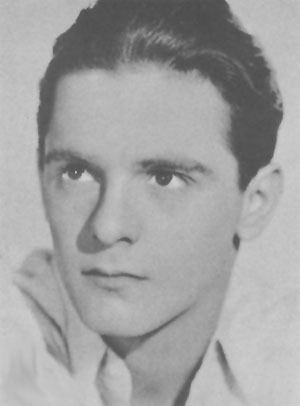 Darro finished his Navy hitch in 1946 and returned to Hollywood, only to find his stock had fallen; he was signed to appear in another B-comedy series, Monogram’s “Teenagers” films (High School Hero, Junior Prom, and others), but was relegated to a secondary role, playing lead Freddie Stewart’s recurring antagonist. 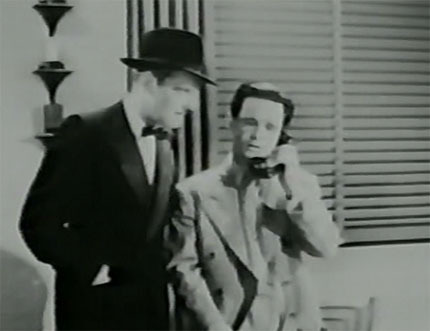 Independent producer Sam Katzman, who turned out the Teenagers series for Monogram, was also the new boss of Columbia’s serial unit, and he gave Darro his final cliffhanger role in Chick Carter, Detective (Columbia, 1946). Unfortunately, Darro’s farewell to the serial genre was an unspectacular one; he played the background role of “Creeper,” the shifty but feisty (and rather likable) henchman of gangster George Meeker; his principal function was exchanging expository dialogue with his boss, although he did get to engage in a few minor pieces of chicanery, deliver some semi-humorous dialogue with typical breeziness, and (in the final chapter) courageously tackle treacherous fellow-henchman Leonard Penn–who, alas, shot Darro’s character dead in the ensuing struggle. Above: George Meeker watches as Frankie Darro makes a phone call in Chick Carter, Detective (Columbia, 1946). After the Teenagers series concluded in 1948, Darro played a few more major roles in some of Monogram’s Bowery Boys films (Hold That Baby, Fighting Fools) and then began to slip into bit roles in films, partly because of a drinking problem that made studios reluctant to invest in him. In 1951, he opened and ran a bar on Santa Monica Boulevard, supplementing the income from his dwindling film work. The 1950s found him appearing in small and large roles on TV shows like Judge Roy Bean, Have Gun Will Travel, and Peter Gunn; he also kept playing bits in features, occasionally winning a noticeable but uncredited character part in features like Operation Petticoat. He also worked sporadically as a stuntman, and in the 1960s lent his acrobatic talents to the Red Skelton Show, appearing several times as an accident-prone “little old lady” in the show’s slapstick-filled “Silent Spot.” His film and TV appearances became more and more scarce as the 1960s wore on; he appeared in only two 1970s films, the second and last being a 1975 crime picture called Fugitive Lovers. He passed away on Christmas Day, 1976, a few days after his 59th birthday. Frankie Darro, like many other child stars, had a melancholy time of it in Hollywood after outgrowing juvenile roles; his youthful fame faded quickly in his later years. Wild Boys of the Road and Pinocchio remain the most famous of his films, but his comparatively unknown serials–especially his six Mascot outings–gave him an even more extensive showcase during the waning days of his stardom. Those chapterplays exhibited Darro’s talent to matinee audiences for many, many afternoons, and allowed him to cry, clown around, and tackle villains with an enthusiasm and sincerity that any young audience member could identify with. Today, the same chapterplays still remain good entertainment, as well as fine vehicles for an excellent child actor. 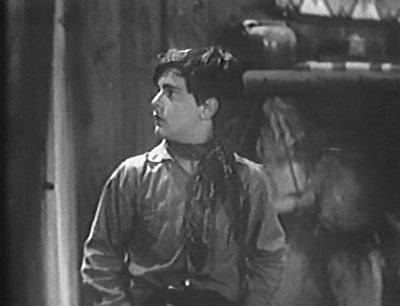 Above: Frankie Darro explores a deserted cabin in the first chapter of The Lightning Warrior (Mascot, 1931). Acknowledgements: For most of the biographical information in this article, I am indebted to the Frankie Darro Homepage, maintained by Linda Kay.